Vogue V8766 is actually a dress I completed a few months ago, but I wore it to church this morning, and that prompted me to write this blog entry. It’s described as being a lined dress with an underlined bodice and narrow hem. I made view F which has a fitted bodice, full skirt and pleated sleeve caps. 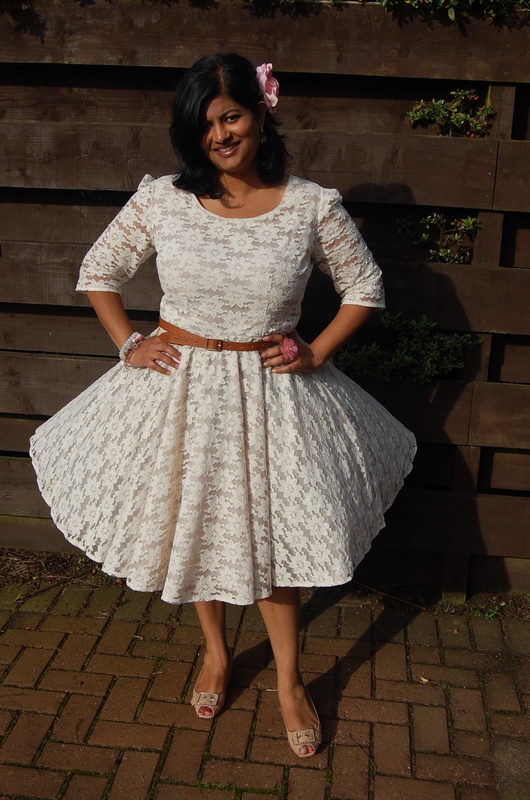 This was an easy dress to make. I bought some cream cotton lace (ebay – a Godsend for “experimenters” like me) and a natural (stone?) coloured lining for the lining/ underlining. I didn’t make any variations and followed the instructions, which were well written. I used an invisible zip because I am too frightened to use ordinary zips (hoping that fear will be conquered post sewing lessons). And hey presto, a vintage look lace dress which can be worn to numerous events, and I have even worn it with opaques when the weather has been cooler. The skirt it quite full and twirly…but of course you could make the slim skirt option if you preferred. I am getting slightly obsessed with lace, and am planning on making a black lace dress in the next couple of months in time for christmas. I am still deliberating on the pattern to use for that. 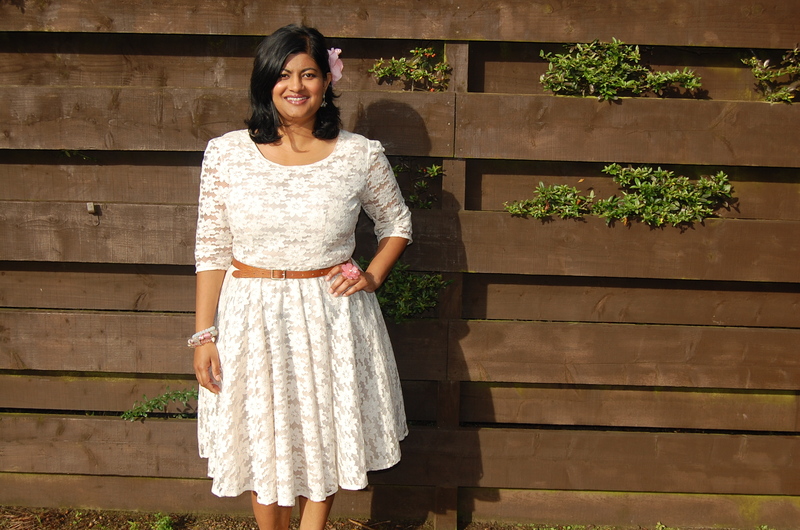 Vogue V8766 – my almost Marilyn moment! That looks gorgeous! So much nicer than the photo they’ve put on the front of the pattern 😉 I have that pattern myself and have always been put off making it, but you may just have convinced me! Hello michaela. You are ami’s friend, aren’t you? Thanks so much for the compliment…means a lot coming from someone of your expertise. 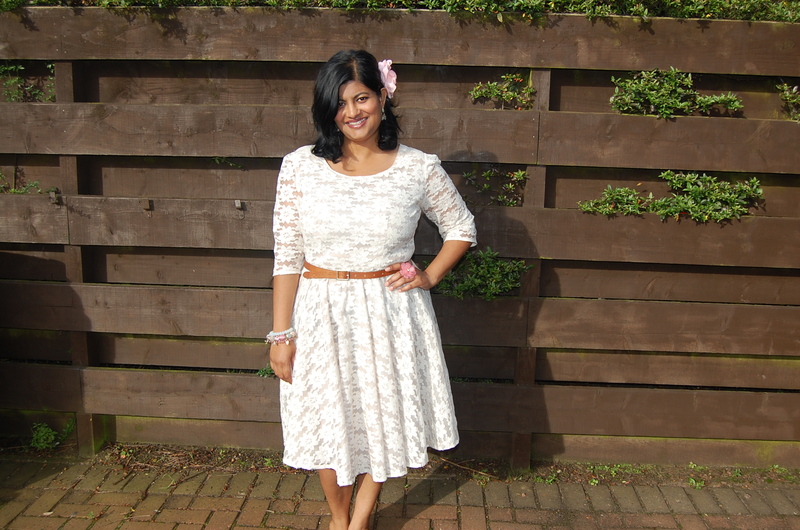 This sewing/ blogging thing becomes addictive! Just finished a Cynthia rowley dress…hope to get it up this weekend. Visit again! Beautiful dress! I found this through your black lace post. I love both versions and am tempted to make myself one now! Thanks danikate! Definitely give it a go! 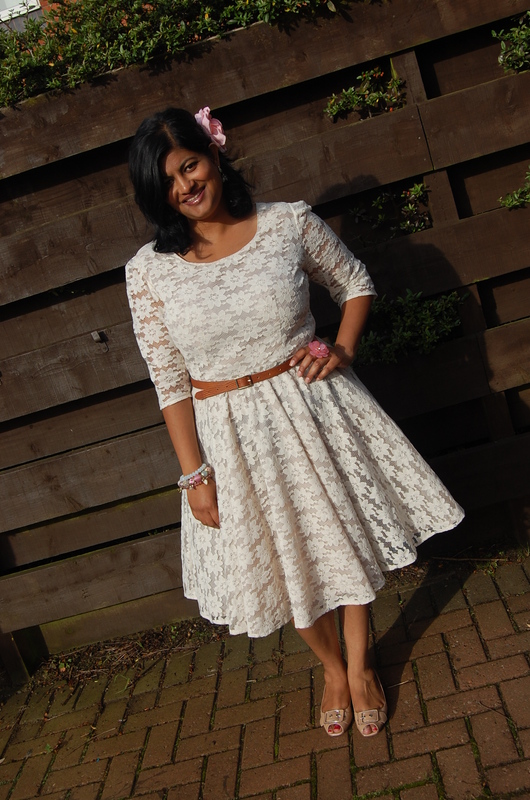 love this lacey dress and your blog. I have the pattern and would like to give it a go. Would you mind sharing where you got the lace from, you mentioned ebay? You make such lovely things. Thanks for that link. I too have to rely on shopping online for all my supplies but have managed a trip to Birmingham and Goldhawk Rd London for fabrics. I do like to ‘feel the cloth’ though!! I just saw this dress on your blog and it is gorgeous! I hope to sew this good in the (near) future . Hi priya. You have to take your bust, waist and hip measurements and select your size according to the measurement chart which will be given either on the back of the pattern envelope, envelope flap or on the fold out instruction sheet. There will probably also be finished measurements of the bust, waist, hips, arm circumference etc printed on the relevant tissue pattern pieces so you could also use these as a guide. With vogue patterns a 1.5cm seam allowance has already been included. All the best. Thanks so much for your quick reply. I will do it.